Cheap is a relative term when it comes to college students. Among the things that can be cheap and expensive, gas prices play a part in their everyday lives. There are three gas stations that are the cheapest as well as closest to the campus. 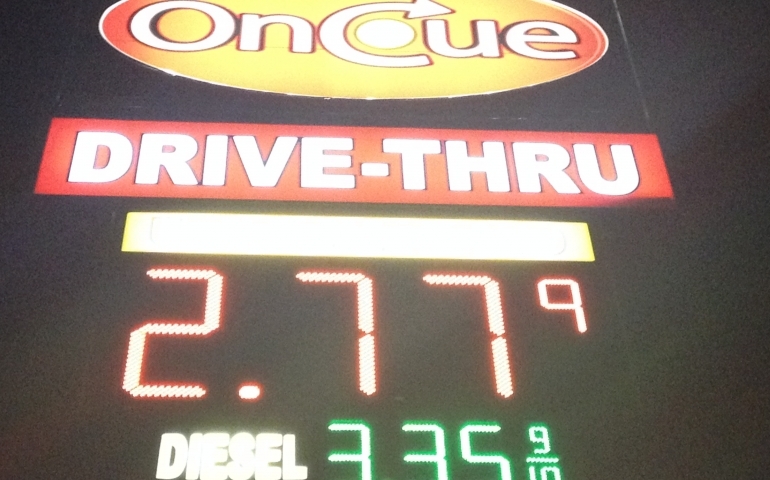 The cheapest gas station closest to campus is OnCue Express with a regular gas price of $2.77. The station has 18 pumps and is open 24 hours. Its location is 7101 NW 39th Expressway. The second cheapest gas station is Flash Mart located on 5850 NW 39th Oklahoma City, OK. The regular gas price is $2.78 and is .8 miles away from campus. The third closest/cheapest station is Valero (Flash Mart 2) which is located on 5850 NW 39th Expressway in Warr Acres. Its regular gas price is $3.45 and is .8 miles away from campus. The cheapest gas station nearest to the Bethany area is the 7-Eleven located at 4432 NW 63rd Oklahoma City. The regular gas price is set at $2.62 and is 3.5 miles away from campus. Emilee White, sophomore Psychology major and golf player, lives in Duncan and normally gets her gas at OnCue located at 7101 NW 39th and only .4 miles away from campus. “I generally go to OnCue because it is well lit and in a convenient location to campus. I also prefer 100% gas rather than ethanol because it’s better for the car and it makes the car last longer in my opinion,” White says. Due to going home sometimes on the weekends and driving to different golf tournaments, White has to get gas every week. “With playing golf, I have to take other variables into account. If the golf course is farther away, I will need to fill my tank more often compared to normal,” White says. On a nationwide scale, the numbers can be influenced by many different aspects. According to John McCrank of Daily Finance, as of October 13, 2014, the San Francisco Bay area has the highest price within the [Lundberg] survey area, at $3.66 a gallon for regular, while the lowest price was in Tulsa, Oklahoma, where regular grade cost $2.93 a gallon. As of October 6, 2014, according to the Daily Fuel Gauge Report, the national average price for regular unleaded gasoline is $3.29. The highest price of gas in the country is in Hawaii with customers paying $4.17 per gallon of gas, according to Alexander Hess and Vince Calio of USA Today, as of March 23, 2014. Because Hawaii is the farthest state from oil production and doesn’t have any oil refineries, it causes the gas prices to become much higher than other U.S. states. It is also due to Hawaii having high oil shipping costs. Hawaii’s excise tax on gas is one of the highest in the country of 17.00 cents per gallon. Compared to Oklahoma being one of the lowest gas taxes at the 46th highest gas tax, Hawaii has the fourth highest gas tax out of the fifty states. Drivers in Missouri are paying the lowest average per gallon with $3.01. In Missouri, geography helps keep the gas prices low. The state doesn’t have any oil refineries and it is also crisscrossed by some of the nation’s larger pipelines. This is due to Missouri’s proximity to Texas, Oklahoma, and the Gulf Coast states. The lower gas prices have made Missouri the most affordable state in terms of transportation. The type of car can also affect the amount of gas that is used. Some cars require more gas than others to run, specifically relating to the car’s gas mileage. With this variable in thought, a key to cheap gas is the kind of car being driven. Considering all of the variables to getting cheap gas, students still have to be able to prioritize in order to attain cheap gas. “The higher the gas prices are, the less we drive. Along with making driving less convenient, it makes you think twice about going to [per say] the movies when you are low on money,” White says.